"After a facial at Advanced Beauty Care, both my skin and spirits are cleansed, revived, and rejuvenated." Advanced Beauty Care spa certificates are the perfect gift for the man or woman who has everything. Show you care by sharing the gift of beauty. Order an Advanced Beauty Care gift certificate today!! Face Forward a fact-filled eNewsletter that keeps you informed of new skin care techniques as well as special offers from the Advanced Beauty Care. Register to receive Face Forward today!! Sophisticated Skin Care. Dependable Results. 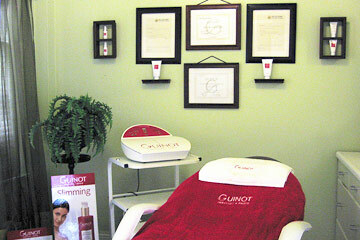 A Guinot-appointed spa, Advanced Beauty Care offers results-oriented skin care in a warm and inviting environment. Catering to both men and women, we deliver personalized service and innovative facial treatments according to your specific needs. With your beauty therapist you will discover the effectiveness of Guinot professional skincare treatments exclusively designed for you to make your face more radiant and reduce the effects of aging. How you treat your skin today affects the skin you will have ten or more years in the future. So, Advanced Beauty Care provides skin care that will not only help you look better today, but also maintain a youthful appearance in the years to come. A visit to Advanced Beauty Care is not simply a relaxing experience: it is an investment in the continued health and well-being of your skin. On each visit, we provide you with personalized music selections, luxurious Frette robes, and plush slippers for your use while visiting our spa. Our serene treatment room offers optimum comfort with a heated mattress pad, warm herbal pack, and neck roll, as well as heated booties and hand mitts. We feature Egyptian cotton sheets and towels, as well as a healthy array of refreshments, including organic snacks, mineral water, and green tea. At Advanced Beauty Care, we we provide sophisticated skin care with dependable results. Invest in healthy skin for today and tomorrow. Make an appointment at Advanced Beauty Care! !